This Friday’s meeting of the Republic of Ireland and Bosnia and Herzegovina will be the second meeting of the nations. The only previous fixture took place in May 2012 when a Shane Long goal secured a 1-0 win for Ireland in the build-up to Euro 2012. Since then, Bosnia and Herzegovina qualified for their first major tournament at the 2014 World Cup Finals in Brazil. Despite going into the tournament with high expectations they went out at the group stages following defeats to Argentina and Nigeria. Following the disappointment of the World Cup Bosnia embarked on the road to Euro 2016 without the retired duo of Emir Spahić and Zvjezdan Misimović and key defender Sead Kolašinac who they lost to a long term injury. The squad was further stricken by injuries to Edin Džeko and Vedad Ibišević in the early qualifiers. The lack of depth in Bosnia’s squad was evident in their poor start to the qualifying campaign, which included just two points from their first four games and resulted in the departure of Safet Sušić as manager. 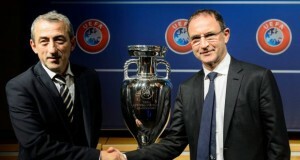 Martin O’Neill and Mehmed Baždarević following the playoff draw. Sušić was replaced by Mehmed Baždarević in December 2014 and he immediately set about restructuring the team’s formation and tactical approach. Bosnia subsequently won five of their six remaining qualifiers with the only defeat incurred away to Belgium. Baždarević appears to be a more pragmatic manager than his predecessor and favours a 4-2-3-1 formation. It is important to note that the war and conflict that took place from 1992 to 1995 in the Balkans impacted on the evolution of the national team and the length of time it has taken for them to become a force in international football. In this regard, the composition of the squad and the individual experiences of many of the players have been shaped by the large-scale emigration that took place in the early- to mid-90s. We’ve taken a look below at some of the key players that Ireland are likely to face over the two legs. Bosnia’s squad includes five players from the German Bundesliga, four players from Italy’s Serie A, two from the English Premier League and one player from La Liga in Spain. There is a good mix of experience from Europe’s top leagues. Irish fans will be familiar with goalkeeper Asmir Begovic from his exploits with Stoke City and more recently with Chelsea. Like much of his country’s population Begovic’s family fled the country in 1992 to escape the war, and spent years in exile in Germany and Canada. Indeed, Begovic represented Canada at the FIFA U-20 World Cup in 2007 and was part of the Canadian senior squad for much of the 2010 World Cup qualifying campaign. However, he accepted a call-up to Bosnia’s squad in August 2009 and has since won 45 caps for the country of his birth. Begovic spent six seasons at Stoke before signing for Chelsea last summer and has established a reputation as one of the most reliable goalkeepers in the Premier League. There appears to be a general consensus amongst those that watch Bosnia on a regular basis that their main weakness is in defence. Despite these suggestions, three of their first choice back four play in the Bundesliga. The back four was shuffled throughout much of the qualifying campaign, but unfortunately from Ireland’s perspective, they now appear to be finding some consistency under the new management. The regular right-back is Mensur Mujdža who plays his football with SC Freiburg. Mujdža had previously played U-21 football for Croatia before switching to Bosnia. The first choice left-back is Sead Kolašinac and he plies his trade with Schalke. Kolašinac was born in Germany and represented Germany at underage level though he qualifies to play for Bosnia through his parents and switched his international allegiance in 2013. Both Mujdža and Kolašinac are examples of how the Bosnian Football Federation (NSBIH) has successfully tapped into its emigrant population. The centre of Bosnia’s defence is marshalled by the 35-year old Emir Spahić who returned from international retirement following their poor start to the qualifying campaign. Spahić previously played for Bayer Leverkusen, but is now with Hamburger SC. During his time with Leverkusen he was involved in a fight with security staff following a cup tie against Bayern Munich and the incident resulted in him receiving a three-month ban from the German FA. Incidentally, Spahić is a first cousin of Edin Džeko. Spahić is likely to be partnered in central defence by Ognjen Vranješ who plays for Turkish club Gaziantepspor. Vranješ is an aggressive and mobile centre half who has displayed his versatility for Bosnia by also playing as a holding midfielder when required. The main holding midfielder in the Bosnian team is Haris Medunjanin who plays for Deportivo La Coruña. Medunjanin was born in Sarajevo but moved to the Netherlands at the age of seven to escape the war. Medunjanin was a member of the Dutch U-21 side that won the European Championships in 2006 and as such he is the only Bosnian international to win a trophy at international level. He switched his international allegiance in October 2009 and has become a key component in their team. In essence, Medunjanin is the player entrusted with providing the defensive discipline in a midfield that favours an attacking approach. Medunjanin is generally partnered in midfield by Muhamed Bešić of Everton. Bešić was born in Berlin and it is understood that he declined an offer to play for Germany at youth level in favour of representing his parents’ homeland. The Everton manager Roberto Martinez described Bešić as a “very complete footballer” that can be strong and aggressive, whilst also technically capable on the ball. The strength of Bosnia undoubtedly lies in their attack, which is based on centre-forward Edin Džeko leading the line, with a trio of attacking midfielders (Višća, Pjanic and Lulić) providing the creative nous. Džeko is the top scorer in the country’s history (44 goals in 74 games) and is the team’s star player. However, Džeko’s early career started slowly and it was only under the guidance of Felix Magath at Wolfsburg that he finally began to flourish. Irish fans will be familiar with his time at Manchester City where he helped the club to two Premier League titles. He signed for Roma during the summer and has already impressed in Serie A and the Champions League. The other star of this Bosnia team is Džeko’s teammate at Roma Miralem Pjanic, who plays in an advanced midfield role. Pjanic was a baby when his family departed Bosnia shortly before the outbreak of war in 1992. His family settled in Luxembourg and he represented Luxembourg at underage level before declaring for the country of his birth in 2008. Known as ‘the Little Prince’, Pjanic has been in inspired form for Roma this season, scoring seven goals in 13 appearances in all competitions. This haul includes five goals and five assists in Serie A, which has helped Roma to third place in the table. The other advanced midfielders in the Bosnia team are Senad Lulić of Lazio and Edin Višća from Turkish club İstanbul Başakşehir. Although less heralded than the Roma duo, both Lulić and Višća add energy to Bosnia’s attack and both players are key to the high pressing game that has become a feature of this team. The challenge posed by Bosnia and Herzegovina should not be underestimated. Whilst they lack the strength in depth of Europe’s strongest nations, the majority of the starting 11 play their football in Europe’s top leagues. They have more Champions League experience than Ireland and on paper, they have more of a cutting edge in attack. Their manager Mehmed Baždarević has a full hand to pick from, whereas Martin O’Neill will have to juggle the pack, which is the result of a combination of injuries and suspensions to key players. The absence of John O’Shea, at least for the first leg, places some pressure on a defence that must contend with the attacking prowess of Džeko and Pjanic. This Irish team generally struggles against opposition that press high up the field and as such, there is a suspicion that Ireland may resort to a long-ball approach in the first leg. In such circumstances, the enforced absence of Jon Walters and the potential absence of Shane Long could be keenly felt. Both O’Shea and Walters have provided leadership throughout the qualifying campaign so the onus is on some of the younger players to fill the void. Despite the lack of familiarity between the Republic of Ireland and Bosnia and Herzegovina the respective footballing nations share some similar characteristics. Both countries have populations in the region of 4 million and must draw upon a relatively small pool of players. This situation isn’t helped in either country by the relative neglect of the domestic leagues. Bosnia’s domestic league is ranked 38th in the UEFA rankings and is only marginally ahead of the League of Ireland, which is currently ranked 41st. To this end both national teams have proved successful at recruiting players from their large emigrant populations. In the case of Bosnia it is worth noting that Begovic, Mujdža, Kolašinac, Medunjanin and Pjanic all represented other countries at underage level before switching their international allegiance. Similar to the FAI, the Bosnian Football Federation (NSBiH) has clearly utilised FIFA’s eligibility rules to good effect. Off the field the NSBiH has been involved in some controversies that even the much critiqued FAI would struggle to replicate. One such example was when the NSBiH arranged a friendly against Iran in May 2008, in a story that Jonathan Wilson subsequently relayed in The Guardian newspaper. Bosnia’s manager at that time was Meho Kodro and both he and his players were opposed to the fixture at the end of a long season. The NSBiH advised that the federation would receive US$120,000 for fulfilling the fixture, but the Iranians let slip that they were paying US$300,000. It suddenly became apparent that certain members of the NSBiH stood to benefit financially from the additional US$180,000. The NSBiH subsequently sacked Kodro for his refusal to fulfil the fixture and Bosnia’s media vowed to boycott the national team until Kodro was reinstated. A handful of the players refused to play, whilst a further 16 players withdrew from the squad due to mysterious ailments or family commitments. The replacement manager allegedly drove round Sarajevo knocking on the doors of players to see if they were available. He somehow managed to assemble a squad, but chaos ensued at the team hotel as nobody recognised anybody. According to Jonathan Wilson, the kit-man noticed a player wander into the hotel, handed him a key and told him to go to Room 212 to get changed, only to discover that it wasn’t a player at all but a local man meeting his girlfriend for an ice cream! Bosnia’s national team has certainly moved on since that episode in 2008 and irrespective of any lingering issues off the field they will provide formidable opposition for Ireland. One ventures that Bosnia have more quality in the right areas and will start the play-offs as slight favourites. Ireland will require a combination of grit and intelligence in the away leg and will hope that a big performance and rousing atmosphere in the home leg are enough to help them advance to the European Championship Finals.